Intuitively, we slow down, look inward, meditate and hibernate come winter. In the cold month of January, we are focused on shedding toxins and emotional baggage, but that doesn’t always have to mean simply going raw. Vata (Air, Ether) – this energy rules the muscles, joints, nervous system. Characterized as dryness and cold. Pitta (Fire, Water) – rules bile and digestive enzymes. Characterized by fire and heat. Kapha (Earth, Water) – rules the connective tissue and mucous. Characterized as oily or heavy. According to Ayurvedic tradition, each of us is made up of uniquely different combinations of these elements, and therefore need to be treated differently when it comes to our health. Someone who is more air-predominant, for example will need less air and more fire and water elements coming from their diet and lifestyle, whereas people with more water in their constitution, will need more fire and air elements to balance themselves. Regardless of our ruling doshas (Need to catch up? Read out Ayurveda 101,) when it is cold, our bodies naturally conserve energy, we move less and eat more. The season winter is represented by the Kapha dosha (one of three bodily humors that make up an individual’s constitution, made up of the the five elements.) The Kapha dosha is made up of the Water and Earth elements. It is grounding. And winter is an opportunity to use this energy to create balance. If we are out of balance there, then we may feel extra tired, lazy or sluggish. In balance, we are steady, strong-willed and powerful. Think of winter’s cold affecting the earth. Perennial plants become dormant, but are still alive and strong – they withstand the sometimes brutal cold and still manage to bloom come spring. This is the energy we need to cultivate during this time. Digestion may slow during this season so it is important to look to our own personal reactions and shift our diets accordingly. We may crave simple mono-meals or may not be able to handle complex flavors that we may have in the previous months. Kitchari can be a wonderful way to nourish and detox at the same time by fueling the body with a stew of rice, beans, vegetables and warming spices that digest quickly and easily. While many of us feel like we don’t have a choice in the matter, it is important that we recognize the seasonal shift and change our routines to match. The more we resist nature’s energy shift the more we may feel drained, sick, or unsettled. Changing with the season may be as simple as starting off the day with a quiet meditation practice or helping to stimulate the lymph with dry brushing or massage. Perhaps cravings have changed and instead of a cold cereal or smoothie in the morning a warm tonic will do. Perhaps you wind down a bit earlier, take a bath and head to bed a couple hours earlier than the norm. These don’t have to be drastic shifts! It is important to keep in mind that cleansing incorporates the whole body. The mind is an area that is often neglected when we experience shifts or changes – and this can lead to stress, indigestion, even weight gain. Hitting the gym is great, but we also need to listen to our bodies and what they are really asking for – rest? Proper nutrition? Yoga? Listen to your body for lasting health. When we’re thirsty, it’s not just water we’re craving, it’s the essential salt, electrolytes and trace minerals that make-up our bones and allow our muscles and organs to function. During winter we may find ourselves craving saltier comfort foods. While we may fight against these cravings, it is important to realize what our bodies are really after. That doesn’t mean going to town on salty processed snacks. Satisfy your craving by adding good quality mineral salts, seaweeds and miso into the diet. For those of us that have a strong Vata energy, often characterized as being variable in mood or energy, a little impulsive and perhaps thinner than average, we may be experiencing the coldness in a more dramatic way. It is essential for this dosha to cleanse with warming foods, whether adding teas, soups, stews or just simply by enhancing juices with energetically warm ingredients and spices such as cayenne, ginger, turmeric and garlic. We may need a little more fat that normal to help our bodies lubricate as we tend to be affected by the wind and dryness more so than the other doshas. This could means adding additional oils to the diet or even lathering our bodies in oil before or after we bathe to help soothe and comfort our sensitive systems. Traditionally, Ayurvedic cleanses include eating kitchari for a period of time for breakfast, lunch, and dinner. We can reap the benefits of this practice by supplementing our winter diets with these same ingredients. Eat more cooked vegetables and root vegetables that are grounding and less fruits, which may be too cooling to the system. Include soups and stews, and supplement the diet with low-starch carbohydrates like buckwheat and millet. Instead of animal protein try nuts and beans (be sure to soak for at least 8 hours to help with digestibility and vitamin absorption). Eat what is in season. Ghee is often used in Panchakarma (an Ayurvedic cleanse) taken first thing in the morning to help increase energy, lubricate the organs, and dissolve toxins and allow them to be carried easily through the digestive tract. It stimulates digestion, soothes the nerves and nourishes all doshas. We’ll be talking more about this soon! Put all the herbs in pot and boil for 5 minutes. This will will help with circulation and the ginger will help with kapha and the elimination of mucus from the system. If you have to much Pitta (heat) don’t drink this tea. 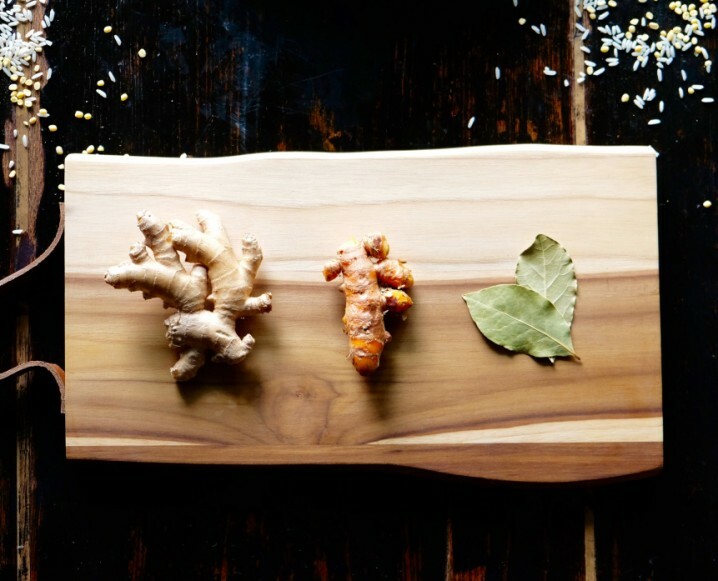 Share the post "Kitchari + Ghee: 8 Ayurvedic Keys To Staying Balanced In the Winter"